NBC sportscaster Ahmad Rashād pops the question on national TV during the pregame portion of the "NFL '85" broadcast of the New York Jets at Detroit Lions game on Thanksgiving Day, Nov. 28, 1985. 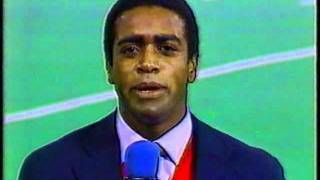 From the field at the Silverdome, he asks a surprised Bob Costas back in the booth to have someone find Phylicia Ayers-Allen, who's at the Macy's Thanksgving Day Parade, and relay the message to her. Phylicia Rashād (born Phylicia Ayers-Allen; ... Ahmad Rashād (1985 ... "Sportscaster Ahmad Rashād Scores with a Televised Proposal to Cosby's Phylicia Ayers-Allen". ... 1985, NBC sportscaster Ahmad Rashad popped the question to his girlfriend, COSBY SHOW star Phylicia Ayers-Allen, ... Check out the romantic on-air proposal below! Ahmad Rashād on-air proposal to Phylicia Ayers-Allen - Thanksgiving 1985 View count: 58747. Baby INC - Baby Shower/Surprise Proposal View count: 202558. Swimmer makes surprise marriage proposal in Mo.